VaultLogix was founded in 2002 in my basement, but our origins date back to 1996 as Data Protection Services we acquired them in 2008. I took a second mortgage on my house to initially fund it, and had many a sleepless night because of that during the early days. But, in early 2004, we were profitable and have maintained profitability ever since. 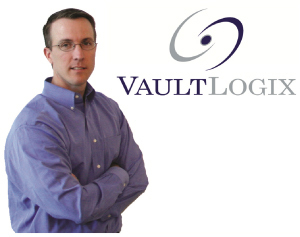 VaultLogix currently is headquartered in Massachusetts, and has data vaults in four locations. We also have a redundant support center in Louisiana. 2/BR: Is your customer base primarily in Canada or the US, or is there a significant international presence as well? We started out selling only in the US, but quickly expanded into Canada. However, in the past 2 years we have added customers from all over the world, and now boast customers in 20 countries across 6 continents. We haven’t cracked the Antarctica market yet, but we remain hopeful! To support our growth, we currently have data centers in US and Canada and are planning infrastructure expansion in Europe and Asia. We currently have just short of 50 FTEs, with about ¾ of them in R&D and customer support. 4/BR: How many subscribers do you have? We have over 5,000 installed business clients, many of which are wholesale partners. We recently announced that we are now protecting over 350TB of user data and growing fast. In fact, I would think since that announcement, we have probably crossed the 400TB mark. We take a great deal of pride in our award-winning vault infrastructure. Our vaults are housed in Tier4 data centers and have been certified under the rigorous SAS 70 Type II auditing standards. We invest in top-notch infrastructure, as we believe that is a key consideration for protecting business data. In fact, all data is mirrored to a second data center as well. Ours is not a consumer service, it is ensuring data protection for businesses that must get their data back when needed. 7/BR: Which companies are your main sales partners globally? Our biggest partner is Ingram Micro. We have also invested heavily in numerous technology partnerships to integrate with most of the top RMM and PSA solutions in the market. 8/BR: What makes your company and its service different from others? ·Ease of use — our software is very simple to install, configure, and maintain. The client needs to be installed on only one PC or server in the user’s LAN, and it can backup any machine it can see on that LAN. The client can even run on personal PC or laptop, so you can backup all your machines using the same interface and web portal for management. It also includes a Local Vault option, so the customer can also use our software to get disk-to-disk backup using any storage available on their LAN as well. ·Speed — our software leverages multiple algorithms, including source and target de-duplication, compression, etc. to greatly reduce the amount of data that has to go over the internet connection. This improves the speed of both the backup and the restore, greatly enhancing the benefit of our solution. ·Customer Support — we have 2 offices in different time zones, each staffed with customer support employees who we train to be experts on online backup and our solutions. We do not offload to call centers in another country, we support our customers with our employees who live and breathe data protection. Our biggest challenges have been related to our growth, and specifically integrating our acquisitions. Cultures, processes, approach can all be different, and it is definitely a challenge to integrate across different companies and get back to a holistic culture and approach. Given the number of acquisitions we have made and the continued success we have garnered, we think we have gotten it down pretty well and look forward to continued growth. I would say that relates to the challenges– the fact that we have successfully pulled off these acquisitions and integrated into a single VaultLogix, and continue to grow. 11/BR: One of the biggest concerns of online backup users is data security and privacy. How have you addressed those issues? We have placed a premium on data security for our customers. We leverage AES 256 encryption and no data is ever off the customer’s premise in an unencrypted format.Â In fact, even our Local Vault stores the data encrypted. Also, our data centers are Tier 4 with access security that would make Fort Knox proud. All of this has been reviewed and certified via our recent SAS 70 Type II audit. 12/BR: How does your proprietary technology compare to the proprietary technology of your main competitors? We think our solution stands up against any of our primary competitors. In particular, our ease of use, automatic upgrades– the software checks for upgrades and installs them automatically each time a backup is run– and scheduling flexibility are key. Of course, the fact that a single install can backup anything on the LAN, without requiring any plug-ins or additional software for major applications like SQL Server and Exchange, is a great feature that gives us an advantage over our competition. 13/BR: How has the online backup business evolved in the past few years, and how do you see it further evolving? I think it has evolved similar to most successful technology solutions. Online backup started small with early adapters, and as companies like ours grew and were successful with it, the market was flooded with entrants, many of which have since exited the business. But, now the technology is accepted and understood– our sales are no longer educational on what is remote backup, but now are educational on what are the advantages of our particular solution. I think we are now in the big upswing of the early majority adapters, and see the market growing substantially for the foreseeable future as it continues to eat away at the tape-based solutions as well as become a de-facto standard for SMBs that currently have little or no backup plan but begin to understand the value that online backup provides versus the cost to the viability of their business if they sustain significant data loss. 14/BR: Large companies like Microsoft and Google have started to offer online storage solutions. Do you fear them? How can you compete with such formidable adversaries? Of course, anytime an 800-pound gorilla like those guys gets near your market, you have to contemplate it in your strategy. However, I think that cloud storage solutions differ from an online backup service in that cloud storage is more about replacing local disks in the office or data center. Users still need the front end applications to talk to the storage, and to perform the specific tasks that the storage is being used for as the data repository. No one wants to spend time copying data from their servers to Google’s storage– you need an application to set up and manage that process, and to create efficiency in the process. In addition, we offer unique client tools and a level of support that Google has shown no inclination to provide to small and midsize businesses. 15/BR: There has been a great deal of M&A activity in the industry during the last few years [such as Iron Mountain acquiring LiveVault, and Seagate acquiring eVault, EMC acquiring Mozy, and Symantec acquiring SwapDrive (Backup.com), VaultLogix acquiring US Data Trust], and most recently DSCopr.net acquiring SafeData.net. What is your strategy? Do you think that the acquiring companies got a good deal or the acquired companies sold too soon for too low? Thanks for the nod! You forgot to mention our other acquisitions as well. Yes, we have acquired four online backup companies, and that has worked well for us in fueling our growth and supplementing our service offerings. We think it is a great strategy, and of course, we think we certainly hope that we got a good deal! We plan on more acquisitions and encourage other online backup service providers to contact us if they are interested in selling their online backup business. 16/BR: In the future, say five years from now, do you think the cost of online storage will remain as it is today, or will it go significantly cheaper? For example, to back up a 1 GB file? Well, pricing has certainly decreased over the past couple of years, but has seemed to stabilize recently. At the cost points that we are at now, it is very difficult to go much lower– there are only so many nickels left before its free, and as we have learned with companies in the past, free is not a sustainable business model. 17/BR: Many have exited the online backup and storage business, including, Xdrive, Yahoo! Briefcase, MediaMax (Streamload), OmniDrive, Zoogmo, and many others. Do you have any comment on that? I think at first blush, a lot of people look at online backup as a simple solution, one that should be easy to run as a business. But, as these and others found out, its not that easy. We are proud that we have succeeded while others have exited. Offsite backup is our business and our focus, and we intend to continue to be the best in the market, and suspect we will continue to see companies enter the market, and leave the market. 18/BR: In the past few years, many small companies and even some banks, such as Wells Fargo, have started offering online backup solutions? Do you think that the online backup market is getting crowded? What do you have to do to stand out of the crowd? Actually, a lot of the companies that you see offering online backup are actually reselling our solution. In fact, when you look at online backup, there really are only a few core technology providers actually developing the underlying technology– us among those few. So yes, the market is crowded, but a lot of that is small companies reselling or leveraging technology from the handful of technology providers. We think we have a solution that meets the market need, and an ability to develop on that technology faster. 19/BR:Any advice for IT companies planning to launch an online data backup and storage business? I think the best advice we can give an IT company thinking about adding remote backup service to their portfolio is– call VaultLogix! We can get those companies up and running quickly, and they can avoid the capital expense and operational cost of managing their own infrastructure and instead be profitable on the business from day 1. Trust us running an offsite backup service is no easy task, and it will take a long time to make that business profitable if you are building it out yourself. It just makes more business sense to leverage someone else, and of course, I think we are the best solution. 20/BR: Do you have any thing you would like to add? I just want to thank you for this opportunity to get our message out. I am excited about the online backup business and the opportunity it provides, and certainly about how VaultLogix is positioned to capitalize on that opportunity. We sincerely thank Tim for the interview opportunity.